I’m so delighted to introduce one of my favorite food bloggers Amy Johnson. She has got a fabulous blog called “She Wears Many Hats” and is about to embark on a new journey as a beekeeper! I can’t wait to see all of the honey this Fall and all of the recipes she conjures up. Today she is going to share a fun recipe with you, which would be good as a Valentines Day treat, or an any day treat. And the best part, is that her husband even made a song to go along with it. Take it away Amy! Nice to meet ya! I’m Amy, from She Wears Many Hats. Last year I was excited to discover Georgia, and have since come to love her through her writings, especially her thought provoking book, Food Heroes. I had the privilege of meeting Georgia in person last fall and she’s even more lovely in person – a true sister, that just so happens to know how to gut a deer. I wear many hats, but not the deer gutting one. Today I’m happy to share a recipe (and a song) with you, perfect for your Valentine or maybe a neighbor that needs a little love. Recently, as I was chatting with friends, the topic of romance rolled around, particularly romance novels. I chimed in of course, like I sometimes do, that it had been years since I’d read a romance novel. Who needs a romance novel when your life is one big romance? You see, I’m married to a veritable Casanova, serenading me at the drop of a hat. It’s a love fest around here folks. I immediately thought of a recipe I wrote about last year, They’ll Make You Sing Muffins. They’re aptly named because after one bite, inspiration struck, and out popped a little ditty from my husband. and, of course, chocolate and butter. Mix all of that up with some eggs, flour, sugar and a splash of vanilla and you’ve got yourself some mighty fine muffins that’ll make you sing. Or at least hum a little. 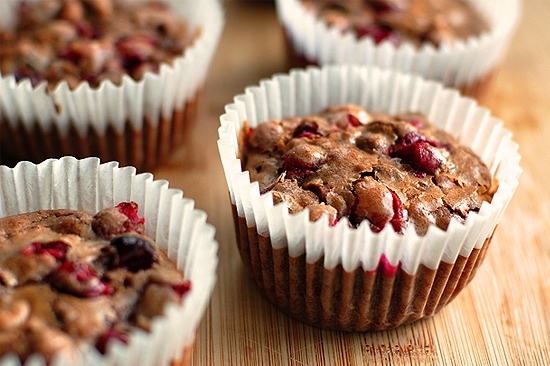 This recipe was given to me by a friend and was originally called Traveling Muffins, but since they inspired song the recipe has been renamed. Plus, as a "Traveling Muffin," they wouldn't last long in my car. 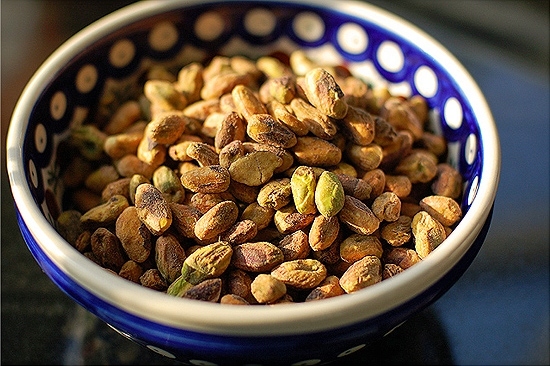 The original also called for raisins (instead of cranberries) and pecans (instead of pistachios). You could easily substitute your favorite dried fruit or nuts in the same amounts. 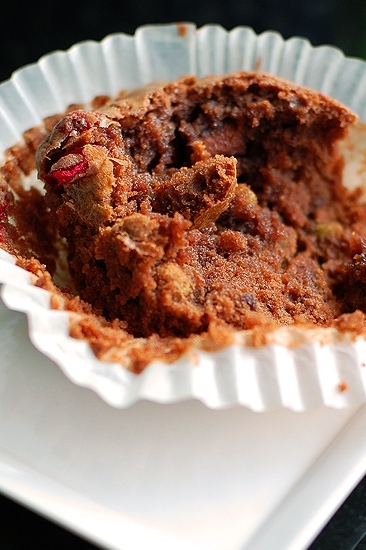 Grease or place paper liners in a muffin tin. 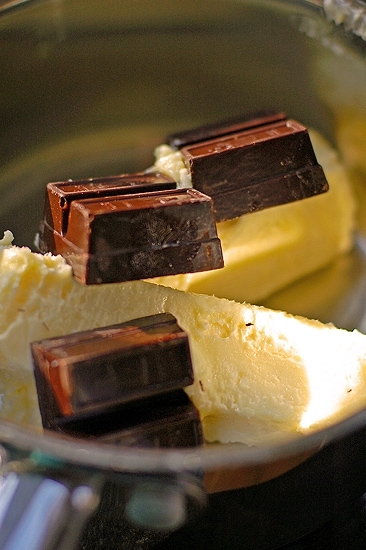 In a small saucepan over low heat melt the butter and chocolate. Remove from heat, add the cranberries and pistachios and let cool. Mix together flour, sugar, eggs, vanilla and chocolate mixture. Do NOT beat; just mix until combined. 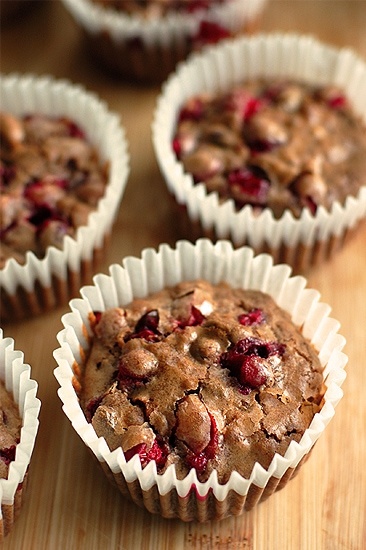 Fill prepared muffin tin with batter. For jumbo muffins, use ~1/3 cup batter per muffin. Bake 30-35 minutes (for jumbo muffins) or until toothpick comes out clean when inserted in the middle. Love that you ladies have partnered up!! 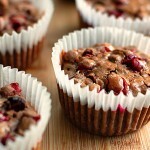 These muffins sing loudly I am sure – love all that dark chocolate in them. Can’t wait to hear more about the bee adventures! Those muffins look amazing. I love the combo of the pistachio and cranberry. At first from the picture I thought it was pomegranate! Fantastic! 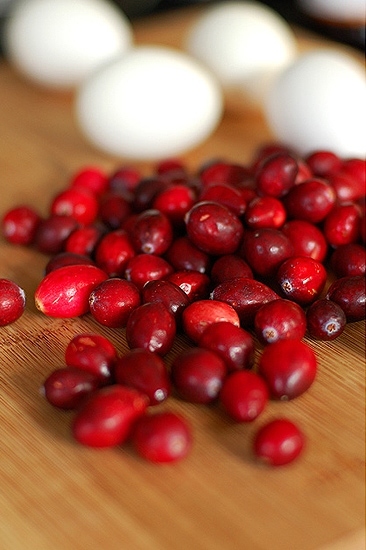 Cranberry and pistachio– two of my favorites! Also, love the Polish pottery. I still use the set my family bought, when I lived overseas growing up.